Case IH 6 to 18 row corn heads – available in narrow or folding configurations - provide increased corn harvesting speeds and consistent chop lengths to help increase productivity without sacrificing chop quality. Case IH has expanded the 4400 series corn head lineup with all-new narrow row configuration options. Completely redesigned from the ground up, the new narrow row corn head is built to match the performance of Case IH Axial-Flow® combines. Available in 20- and 22-inch spacing, new narrow row corn heads will help producers pick cleaner, harvest faster and pick down corn better to save more grain. Chopping and nonchopping configurations options are available to fit your residue management system. Take a load off your combine with a lightweight head — up to 2,000 pounds lighter than competitive models — that floats over the ground and reduces compaction. Separate drive lines power the row units and choppers, providing more efficient power data control and additional protection to the drive lines. Power is driven from the gear boxes in the center of the head and split equally to the right and left side of the head; this clean design improves power flow. New flip-up tall-corn attachments are integrated into the other dividers and help prevent loss of corn ears over the ends of heads when harvesting in tall stands of corn. Updated stalk roll spiral patterns are now optimized for today’s challenging crop conditions and can handle a wider range of stalk diameters and stalk health. The divider profile and hood design aid in smoother crop flow. Then CornLouvers™ channel corn ears and loose kernels into head for enhanced grain savings. To ensure the highest levels of quality and reliability Case IH has made significant investments into head manufacturing. The Burlington assembly plant embodies the heritage of Case IH and began building Case combines in 1937. The new corn head includes many features that allow it to pick more corn, at higher ground speeds in very adverse conditions. Not only has productivity and grain savings been maximized, but the actual service and maintenance has been simplified to allow for more time spent harvesting. This 6-row 4200 corn head includes many features such as heavy duty drives and superior residue and stalk processing for high quality corn harvesting. Compatible with 2100, 2300, and 2500 Series Axial-Flow® Combines. The 8-row 4200 corn head includes many features such as heavy duty drives and superior residue and stalk processing for high quality corn harvesting. Compatible with 2100, 2300, and 2500 Series Axial-Flow® Combines. The 6-row 4406 corn head delivers highest quality corn harvesting. Compatible with the 88, 130, and 140 Series Axial-Flow ®combines. This 8-row corn head includes the latest innovations in harvesting technology, allowing it to pick more corn, at higher speeds in adverse conditions. Compatible with the 88, 130, 140, 20, 230, 240 and 10 Series Axial-Flow® Combines. This 8-row corn head includes all the latest innovations in harvest technology plus folding for transport. Compatible with 10, 20, 230, and 240 Series Axial-Flow® Combines. This 12-row corn head delivers powerful performance and superior reliability for the highest quality corn harvesting. 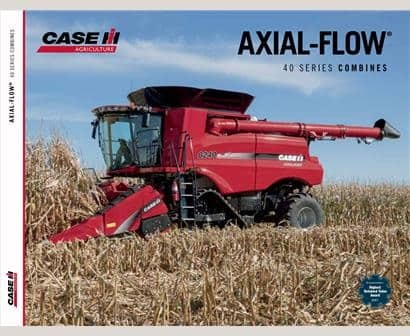 Compatible with 6088, 7088, 6130, 7130, 6140, 7140, 10, 20, 230 and 240 Series Axial-Flow® Combines. This 12-row corn head delivers power performance and superior reliability for high quality corn harvesting, plus folding for transport. Compatible with 10, 20, 230 and 240 Series Axial-Flow® Combines. 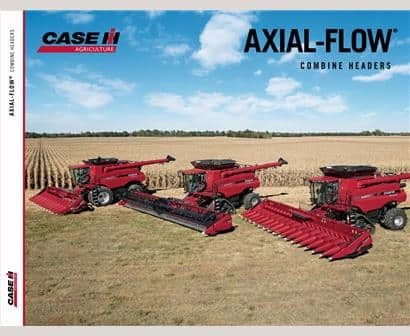 This 12-row corn head from Case IH, available for the 20 and 22-inch market, includes all the latest innovations in harvesting. Compatible with 10, 20, 230, & 240 Series Axial-Flow Combines. This 16-row corn head comes in a non-chopping version and delivers superior reliability for the highest quality corn harvesting. Compatible with 8120, 9120, 8230, 9230, 8240 and 9240 Axial-Flow® Combines. ​​This 16-row corn head, available for the 20 and 22-inch market, comes in a standard and chopping configurations for high quality corn harvesting. Compatible with 8120, 9210, 8230, 9230, 8240 and 9240 Axial-Flow Combines. This new 18-row corn head, available for the 20 and 22 inch market, comes in a standard and chopping configurations for high quality corn harvesting. Compatible with 8120, 9210, 8230, 9230, 8240 and 9240 Axial-Flow Combines. Case IH corn heads give you ultimate grain-saving capability. 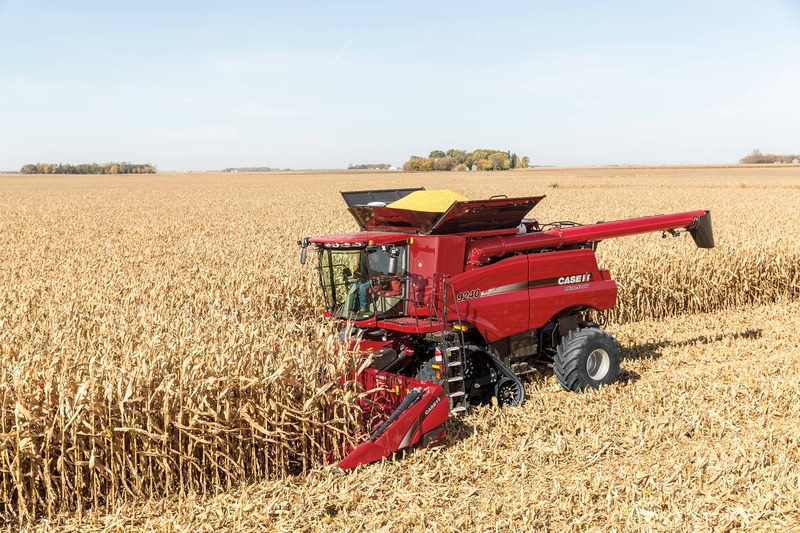 Visit the Case IH blog to learn more about how you can achieve a high-efficiency harvest. ​Compare our corn head specs to other manufacturers' specs.